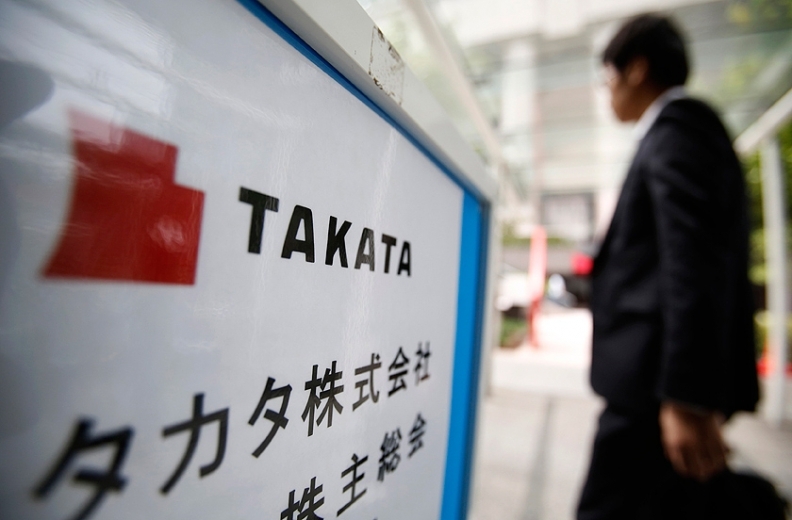 TOKYO (Reuters) -- Takata Corp. is likely to seek more capital around September as it expects its finances to take a hit from a rise in costs to recall potentially defective airbag parts, Kyodo News reported today. Takata is expected to narrow down which companies to approach for investment, Kyodo said without citing sources, adding that candidates would include automakers such as top client Honda Motor Co.
A Takata spokesman declined to comment, while a Honda spokesman said it had no plans to provide additional financial support to Takata. More than 50 million airbags around the world have been recalled to replace Takata's inflators, which can explode with too much force and spray metal shards inside vehicles. Automakers have said they would discuss how to split the cost of the recalls with Takata once the cause of the defect is identified. A handful of investigations by Takata, automakers and transport authorities are currently underway. In the meantime, major automakers including Honda and Toyota Motor Corp. have said they will stop using Takata airbag inflators in new vehicle models, and have been sourcing replacement inflators from alternative suppliers. Takata will decide how much capital to raise upon gauging the scale of the recall costs, Kyodo said. Given current recall figures, industry experts estimate that Takata could face a recall bill of about $3.5 billion if it is found to be responsible for the defective airbags, more than double the company's current assets of about $1.3 billion as of December. The Japanese company has already been fined $70 million by U.S. transport authorities. It also faces class action suits in the U.S., where the majority of airbag-related injuries occurred. Takata has been under pressure to isolate the reason behind the defective airbags, which appear to be triggered when moisture enters the chamber containing the chemicals. Reuters in January reported that Takata CEO Shigehisa Takada, the grandson of the family-owned company's founder, was willing to resign over the recall. Other suppliers including Sweden's Autoliv Inc., German-U.S. supplier ZF-TRW and Japan's Daicel Corp. have ramped up production of replacement inflators.